The latest product from MFT is laser designed and handcrafted from Boltaron polymer. HORSHAM, Pa. — Mission First Tactical, LLC (MFT™), a leader in USA-made rifle/carbine accessories, is proud to release its latest product, the Versatile IWB Holster. MFT's proprietary Polymer design, technology and production has developed a laser precise, passive retentive, holster offering carry inside the waistband, outside the waistband and appendix positions for a right or left-hand shooter. “We created these holsters for the shooter looking for a rugged, durable, precision fitting holster that is versatile and comfortable to wear in a variety of carry positions. It’s also great for shop owners as one holster can do it all. Laser scanning of the handguns translates to the creation of CAD files from which unneeded elements are eliminated, creating less wear and a smoother draw and reholstering. 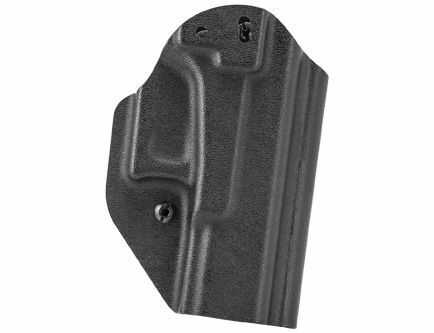 These holsters are hand formed in our plant using Boltaron, a polymer offering superior fit and finish with greater wear, chemical and temperature resistance. Our goal, which we have met, is to provide hand finished holsters each meeting our exacting standards and we can do that with immediate delivery. Shooters may customize the retention and cant to their exact liking. Highest quality hardware provides lifetime service. Each unit includes our 1.5" belt clip, yet other hardware may be easily substituted. It is available boxed or bagged with eye catching displays.” said MFT’s Vice President David Edelman. Made in America Lifetime warranty. For more information on Mission First Tactical, visit www.missionfirsttactical.com.